Have you ever wondered why some people seem to live happier and more inspired lives than others? Those that are truly on fire in their lives and who get to enjoy a richer and more meaningful existence are the ones that get to play with their inner creativity each day. While some people value things like fame, money, power, success, and many other trappings of the world, ironically none of them are likely to a deep sense of meaning and fulfillment.That’s why so many people who achieve their goals in life still end up feeling like something significant is missing from their life. What’s missing is what makes your heart sing. The difference between a goal and what makes your heart sing is that goals are future based and belong to the mind. Whereas your creativity flows from the present moment and is connected to your heart and spirit. Being creative is also fun. It means you get to play with new ways of being and doing in whatever creative pursuits you enjoy. One of my favorite creative endeavors is to write, another is to play music. I’m constantly writing new things and playing new songs I have created on a daily basis. Not only does this fulfill me on a daily basis, but it has also given me the source of inspiration I needed to take what I love to do with my creativity and make it my life’s work. I cannot describe just how amazing it feels to wake up each day knowing that I get paid to create things that I know will benefit others in so many areas of their lives. There are a number of studies that have been done recently on the impact of meditation on creativity. One particular study revealed that prior meditation experience was not necessary for meditation to have a positive impact on creative thinking. This is really great news because it reveals that our brain is capable of opening up to deeper levels of creative thinking quite quickly. I still recall how after just 6 weeks of daily meditation I was able to write a 254 page, self-help book that literally popped into my head overnight. I wasn’t even thinking about writing a book at that stage as I was just a beginner meditator. I struggled to know what to write in birthday cards prior to meditating. That’s why I was completely blown away when after I did my usual morning meditation I had this entire concept for a book pop into my head. It came with the name of the book, the chapter titles and an understanding that if I just sat down and started writing, that the content would flow through me. And that’s exactly what happened. Six weeks later, the book was finished. I then went on to sell 28,000 copies of this book. The best part though was that I received hundreds of testimonials, emails, and reviews where people shared how much this book had transformed their lives for the better. I even had people come up to me to get their copies personal autographed and to give me a hug to say thanks. All this happened because I started meditating and somehow my inner creativity was unleashed. But it’s not just unleashing your creativity that matters. You also need to learn to trust it. That means being able to get out of your own way so your inner genius can flow uninterrupted through you and into whatever creative pursuits you are into. This is probably the most challenging part of all because it means surrendering the need to be in control. Creativity is the opposite of control. It is trusting and flowing with whatever is naturally arising from your mind, heart, or spirit, and then letting it flow from you without hesitation. It doesn’t matter if you use it for cooking, cleaning, singing, dancing, acting, painting, loving, gardening, or anything at all that you can let your inner creative brilliance shine through. You’ll know when it’s working for you because you’ll have a rush of energy moving through you that gives you such a beautiful natural energetic high. Here’s a really simple meditation to help get your creative juices flowing. 1. Find somewhere comfortable to sit or lay down. 2. Close your eyes and take three slow, deep breaths, and then let your breathing return to normal. 3. Next, you will be using counting to stay focused on the breath. Your breathing is not forced in any way – it just stays natural and easy. With each out-breath count a number. The first out-breath will be one. Then, breathe in and out again and count the number two. Continue counting until you get to the number four and then start back at one again. If you lose your place while counting just start over again at one. 4. Continue to count your breaths for 5 to 10 minutes. 5. When you feel like you are done, lay down and relax completely. This is time for you to let go of the need to focus on anything and let your meditation move deeply into every cell of your body. Keep your body as still as possible during this stage. 6. Now go do something creative for the next 10 to 15 minutes. 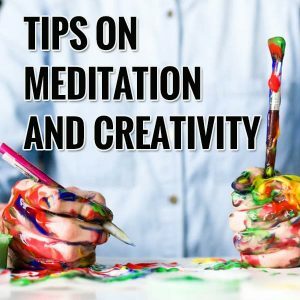 If you do this simple creativity boosting meditation daily you’ll soon notice a big difference in the levels of your problem-solving abilities, as well as a general improvement in the ease at which you can turn your creativity on and off at will. There are other meditation techniques you can use that will help as well.